Here is a slightly unusual view of Jubilee Bridge, as it was mostly photographed as part of the river scene. The kiosk beside the Edwardian turnstiles, with its thatched roof, ornate woodwork and coloured tulips on the glass panes of its windows, was very picturesque. If you look closely at the bridge's ironwork you can see it had been painted in various shades, despite this being a black and white image. It was later painted a dark green though is now back to how it looked originally (see previous image for description of the colours used). During the tourist season there used to be a charge to cross the bridge and the turnstile and kiosk, at the promenade end of the bridge for over half a century, were to control the crowds and take their money. The signboard advertises the bridge as the entrance to the Lovers' Walks - access had been by ferry before the bridge was built - as well as to hear the performances of the local band close up. The band played in the bandstand, or band kiosk, on the Lovers' Walk side and performed for two hours at a time, with a two hour break between performances. There had also been a charge for residents using the promenade next to North Parade but this was abolished in 1910 when Matlock Bath's Council faced some criticism. It was alleged that the village "enjoyed the unenviable distinction of being the only pleasure resort in England where people had to pay for the privilege of walking on the promenade". The fee had been tuppence, but it was announced at a Council meeting in February 1910 that things were about to change and the prom was to be enjoyed free of charge. Whilst Matlock Bath were still paying a loan off, the Council expected revenue would come from more boating, that they would have to pay less for the band and there would be more income generated from hiring the pierrot stand. 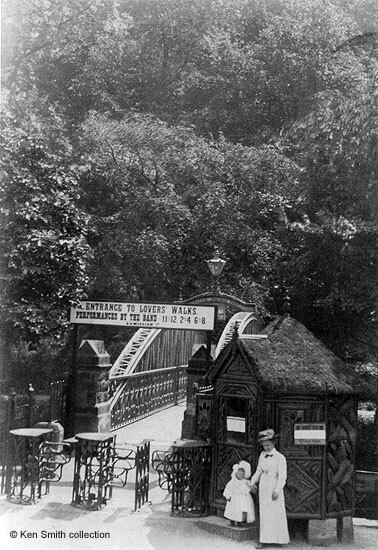 The turnstile shown above was placed beside the bridge, and those who wanted to walk on the Lovers' Walks were charged 2d, which is on the sign about the band. Postcard in the collection of and provided by and © Ken Smith. Barton, David A. "Around Matlock in Old Photographs", (1998) part of a series called "Britain in Old Photographs", Budding Books, ISBN 1-84015-076-9. "Belper News", 25 Feb 1910. Prom free but not Lovers Walk. Report of Council meeting.